This was an interesting proposition from economist Steen Jakobsen: take 6 months off from the market. With the S&P 500 P/E ratio at 20 and the Shiller CAPE at 27, the market does appear historically overvalued. But stocks are a security like any other. You take the risk-free rate of return (10-year treasuries at 1.9%), add a risk premium to make up for volatility, and you get stocks’ acceptable yield. If you don’t trust me, look at historical 10-year treasury yields against nominal GDP against the inverse of the S&P 500 PE ratio against the inverse of the Shiller CAPE (the inverse is earnings yield off market cap). Before the 1960’s it looks like expected corporate yields didn’t follow treasuries. Since then they’ve moved almost in lockstep (for more on this, read my previous post on how stocks are fairly valued). With treasury yields safely under the inverse CAPE (and well under inverse PE), and with treasury yields not likely to rise much in the near future, we must come to the conclusions that 1) stocks are fairly valued now and 2) stocks will generate fair (not good) returns into the near future. 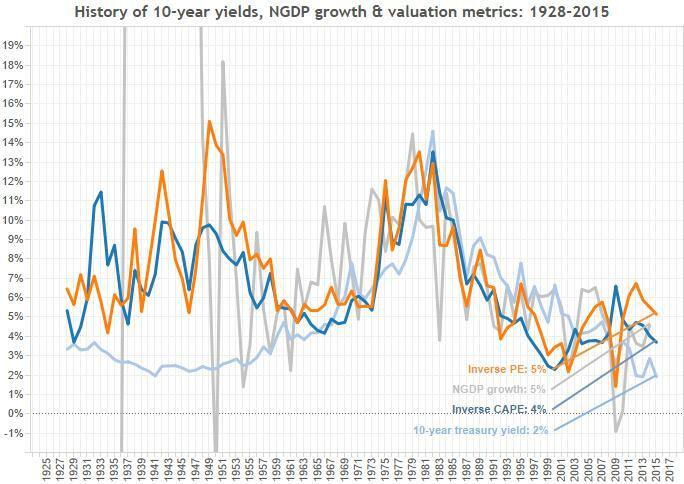 Think 5% per year rather than the 10% CAGR we’ve become used to since 1960. But don’t fret: inflation-adjusted returns since 1960 have been 6%. With inflation between 0-2%, and expectations not going anywhere beyond that, we’re looking at real returns around 4%-5%. Not great, but not terrible either. But if you could just wait 6 months as Mr. Jakobsen says, maybe you could get the best of all worlds. You could buy stocks after they crash and generate those 10% returns (or more) that you’ve grown used to. There certainly could be a crash, or a large correction. I can’t deny that, but what are the chances? When have we had long-lasting bear markets? We had one after the dotcom boom and another after the 2008 crisis. Looking at the graph above: in the late 1990’s, the yield on 10-year treasuries was far higher than the expected yield on the S&P 500. This clearly wasn’t sustainable, and stocks rightly corrected to a lower level. In 2008, the economy was collapsing and there was a clear risk of owning equities in bankrupt enterprises. Corporate income yield based on PE tanked, while CAPE (smoothed out across 10 years) spiked to show an amazing buying opportunity. Suffice to say, neither of those crashes came out of nowhere. The dotcom boom was a real bubble. The 2008 crisis was an economic catastrophe caused by tightened monetary conditions, aided and abetted by the Fed. Could the Fed unlearn the lessons of 2008 and tighten in the face of depressed demand? This is a possibility. If Europe successfully exports deflation to the United States (our latest jobs report suggests that this may be happening via the exchange rate mechanism), the Fed may not have the political stomach for QE4. Conditions could become depressed very quickly. Falling nominal demand would cause a stock market crash. But no one expects the Fed will unlearn its lessons so quickly, especially under Chairwoman Janet Yellen. With the growing prevalence of ETFs, investors can purchase a broad cross-section of stocks with little effort and ultra-low fees. The risks of ETFs are systemic. We’re bundling and securitizing the stock market. But that means less individual risk and lower expected returns. Thus we’re forced to accept that the market won’t give us the returns we’re used to, but neither will it crash spectacularly as in 2001 or 2008. There may be a correction and quick recovery, or there may be lots of mini-corrections with an upward tilt of 4%-6% per year, or there could even be a mini-boom with a subsequent correction. Meanwhile in 6 months when the market is 2%-3% higher than now, what will you do then? Wait another six months? When the same question comes again in a year, do you wait again? Do you earn nothing in cash, almost nothing from treasuries? With interest rates probably not moving up anytime soon, and with markets gaining in efficiency with the use of ETFs, waiting for a market crash could take very long indeed.